Special thanks to Floyd for sending this one in. If you’ve every struggled with coming up with fresh ideas for [tag]basketball on court conditioning drills[/tag], try this out! 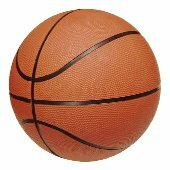 One [tag]basketball drill[/tag] I like is to have a coach under a basket with two balls. The [tag]basketball coach[/tag] rolls the ball out on the court and the player,facing the basket, has to turn, find the ball, pick the ball up, and make a lay-up. If the [tag]basketball[/tag] is on the right side of the court he/she must use their right hand if on the left he/she must use their left had. While the player is picking up the first ball and making a lay-up the coach rolls the second ball on the court. Without stopping the player now must turn find the other ball retrieve it and make a lay-up. This continues for 30 seconds. 1.The player must find the ball and pick it up, not try to dribble it before picking it up. This teaches to secure the ball before trying to do something with it. 2. Once the player retrieves the ball he/she must drive hard to the basket on the side of the basket the ball is on and use that hand to make the lay-up. This is a good drill especially if you are using a trapping defense. 3. 30 seconds may seem like a short time, but this is also a great [tag]basketball conditioning drill[/tag].